Education for its own sake is always a noble pursuit, but unfortunately with the cost of education soaring not everyone can afford it. If you are going to choose between community college and trade school, sometimes choosing a trade can give you better career prospects in the long run. And if you are of a socioeconomic status where you don’t have access to resources for education for the sake of education, you probably also need the best possible job prospects, too. But it’s not at all a bad thing – the world needs tradespeople much more than they need someone with a mountain of student loan debt and no job prospects. But affordability is not the only reason to attend trade school. Worldwide, 30% of high school graduates go to college because they think it is the normal progression of things to do. Many struggle and discover a traditional school isn’t a great fit for them, but society still tries to push higher education on them. You should choose college if your career path requires a college education or if you want an education for the sake of getting an education, not because someone else tells you to go. After all, those people telling you to go to college aren’t going to be there when you are trying to figure out how to cover your living expenses. Community college can be a much more affordable alternative to a regular college, costing less to earn an associate’s degree in two years than an average year of state four-year college. Trade school can be very costly, but you can be finished in a year and often making as much as a college graduate right away. Trades are also great because they are generally things that people are going to need no matter the economy, how much money they make, or whatever. People always need auto mechanics, and they tend to even need them more when the economy is doing poorly. People always need HVAC technicians because you have to be able to stay warm in the winter and cool in the summer. People always need plumbers because you have to have running water. There’s great lifelong job security in many trades, which can be a very important factor in making a decision that is going to last the rest of your life. 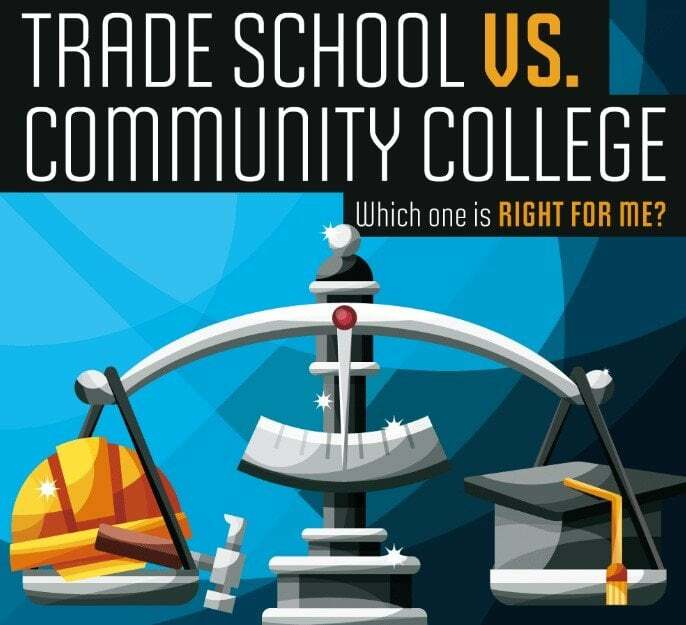 Learn more about trade school versus community college from this infographic.